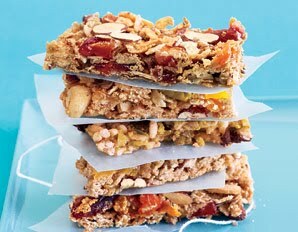 You can easily bake up a batch of your own energy bars choosing which ingredients you want. Here is a handy mix-and-match chart you can print out for ideas. Near the end of the article is a link to some of their favorite combinations if you want to use their recipes. These energy bars are great to include in kids’ lunches, for healthy snacks, and for taking along to soccer games, hikes, road trips, etc. Click here for the recipe at Prevention. The recipe makes 12 bars, but you can double it if you like.